Today I have the pleasure of introducing you all to our newest recruit, Jess Anastasi. Please give her a warm welcome! Woo, staright away with the hard questions. Okay, I live in regional Victoria, Australia, not too far from Melbourne. Its the boring part of Australia. There's no big red desert, no outback, no pristine tropical beaches, no world-renowned vineyards and no rainforest. There are some kangaroos though! I have a very supportive hubby, a couple of kids and a dog who thinks she's a kid. Like many writers, I have a busy life and write when I can. Its set 500 years in the future. Humans have colonized other galaxies, but are on the verge of being wiped out by an on-going four-hundred year war between angels and demons. The heroine, Tori, sees something she's not meant to, so the demons are after her for information. The angels send the hero, A'albiel, to protect her. They're fleeing to Sanctuary, a planet protected by ancient pacts, and along the way they find danger and romance. 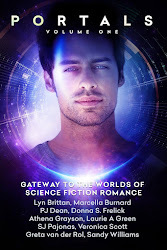 My first book, Sanctuary, is coming out with Noble Romance Publishing (http://www.nobleromance.com/) on the 22nd November. It will also be availble from book-buying websites like Amazon. I think its the possiblities, the endless options, the fact that there are few boundries and you can take your characters anywhere and have them encounter anything. There aren't many genres that can boast that! It leaves a writer with the freedom to have their characters fall in love under the most amazing circumstances. I probably lack confidence in whether or not it sounds genuine and makes sense. Some sci-fi fans are hard-core and I'll never be that. Though I like the idea of my characters flying around in spaceships and having all sorts of helpful technology, I'm probably not so strong on the science-side of things. Easy! Joss Whedon, you are a god. Serenity, because I just loved Firefly so much. All that wasted potenial... don't get me started! Favourite book would be Linnea Sinclair's Accidental Godess. I'm going to cheat, because Joss Whedon did write a couple of graphic novels that went with Serenity/Firefly. Strand me in the 'verse with Mal and I'm a happy woman! Stargate! Travelling to other planets in a single step sounds great. And who wouldn't want to go on a couple of missions with SG1? Although, I'd probably get shot as soon as I stepped through the stargate coz I'd be too busy perving on Daniel Jackson. Jess has been making up stories since she can remember. Though her messy handwriting made it hard for anyone else to read them, she wasn't deterred and now she gets to make up stories for a living. She loves loud music, dumb movies, and a good book on a rainy day. 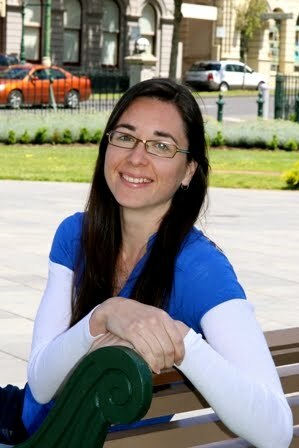 Jess lives in regional Victoria, Australia with her very supportive husband, two kids and one spoiled border collie. For four hundred years, angels have been at war with demons while humans fight both, trying to survive. As world after world is destroyed by the conflict, there is a race to terra-form planets for colonization before mankind is wiped out altogether. Toriane Cresol is part of a team leading the terra-forming charge. On assignment, she stumbles across a scribe and six warrior angels hiding sacred relics. Within a few hours she comes face to face with A’albiel, an angel sent by Archangel Michael to protect her from the demons, who want to know what she saw. Ripped from her life, Tori is taken on a flight across the galaxy by A’albiel, their destination is Sanctuary, a planet protected by ancient pacts, and the only place the demons can’t get her. Though hate for angels and demons alike is ingrained deeply within her, Tori can’t fight the growing spark of attraction between her and A’albiel. Bit by bit, everything she once thought or believed is eroded away, replaced by the knowledge that if she and A’albiel don’t make it to Sanctuary, the entire fate of the universe could hang in the balance. Nice interview, Jess. You'll fit right in here--plenty of browncoats like to dock at SFR Brigade. Most of them fight over Cap'n Mal. Me, I'm stalking Kaylee. Great post, Jess and congratulations!! I'm sure you'll do well. Sounds like a great book, Jess. Great to see you here, Jess. And fab post! I'm loving the whole concept of this story. Sounds fantastic! Hi, Jess, welcome! Great interview, and yahoo, another Firefly fan. You can't take the sky from me. Great to have you "on deck." Welcome aboard, Jess! I'm a bit intimidated by real science, too. Thanks heavens for fiction! lol! I'm glad SFRB came together - it's so great to be a part of a group with like-minded people. And none of my friends understand the tragedy of firefly being cancelled! Thursday Tag Party for Turkey Day! TANGLED IN TIME Gets a Holiday Early Release! Thursday Tag Party for 11/18/10! Cowboys & Aliens, oh my! Thursday Tag Party for 11/11/10! Thursday Tag Party for 11/4/10! Will Our EPIC Award Finalists Please Take a Bow!